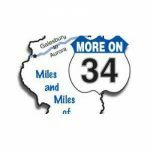 More on 34 is an annual celebration that encourages visitors to explore the Route 34 corridor of Illinois through shopping events. The event extends from Aurora to Galesburg and incorporates all communities in between. Towns participate in More on 34 by hosting community garage sales, business sidewalk sales, and other special activities during the weekend. If you have questions about getting involved in More on 34 for Sandwich, Somonauk or Plano please call the Chamber at 815-786-9075 or email executivedirector@sandwich-il.org.